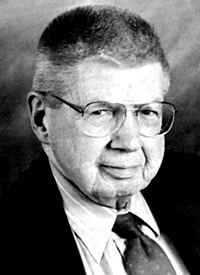 The engineering world lost a considerable talent on June 8, when distinguished emeritus faculty member George Cooper passed away at age 88.
Cooper received his bachelor’s, master’s, and doctoral degrees from Purdue, and upon receiving his PhD in 1949, joined the faculty of the School of Electrical Engineering. He concentrated his research in the areas of communication theory and system analysis. From 1965 to 1969, he was assistant head for graduate study, and in 1975 he became coordinator of graduate study, a position he held until he retired in 1985. With a career that spanned over 40 years, Cooper’s contributions to Purdue’s ECE program — and the field at large — are legendary. He is named as inventor or coinventor on 10 patents; author or co-author of six textbooks and 75 technical papers; and a former program consultant for the U.S. Department of Defense. Remembered as a kind, patient and compassionate man, one who epitomized integrity in work and life, he had a tremendous impact on Purdue’s history. His former students recall a riveting and insightful professor. In addition to his faculty appointment, Cooper consulted widely on radar system analysis, automatic control systems, sonar arrays, seismic signal processing for the petroleum industry and spread spectrum communications systems. After retirement he served as a principal scientist/engineer for Hughes Missile Systems Co. He was a life fellow of the Institute of Electrical and Electronics Engineers and a recipient of the Purdue’s Outstanding Electrical and Computer Engineer award.